Was it really just last month that Dunes and I were in High Point, North Carolina, for the furniture market? I would have a better handle on what day it was if I hadn't caught a cold down there and spent the last three weeks coughing up a lung. Funny-not funny-but the same thing happened to me last October! I guess I need to up my hand sanitizer game. So you weren't in High Point? What did you miss? 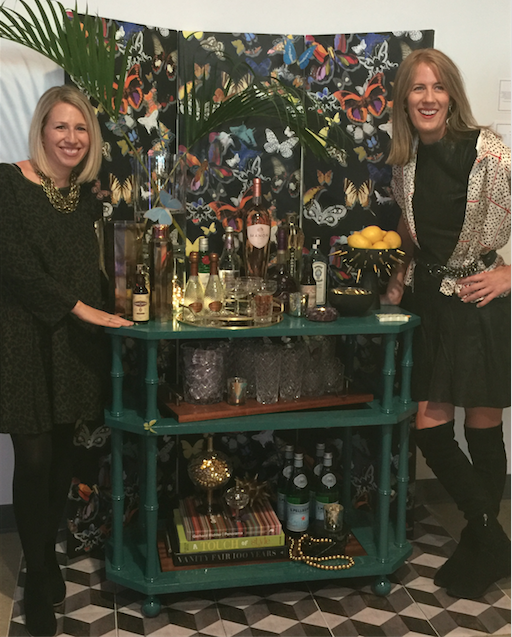 Well, you missed sitting in our new chairs, seeing our new sconces and bench, meeting India Hicks in our booth, drinking bellinis, shopping our goods and celebrating Dynamic Women in Design in about that order. Here's the deal. I'll make it easy on you. I took lots of pics and you can tell your friends you were there because I'll take you on a tour of the booth. But you're still missing sitting in those chairs and they are incredibly comfortable! As you can see there was a lot of new stuff we added to the line, some of it not even available to see here on the web site yet. Let me walk you through a few highlights. That's Rachel and me flanking the bar cart at Heading Home to Dinner. The thing that's different about our bar cart (besides the fact that it's wood and sturdy enough to hold an elephant drinking a beer) is that there are also two removable trays. These trays are done in mahogany with silver handles. 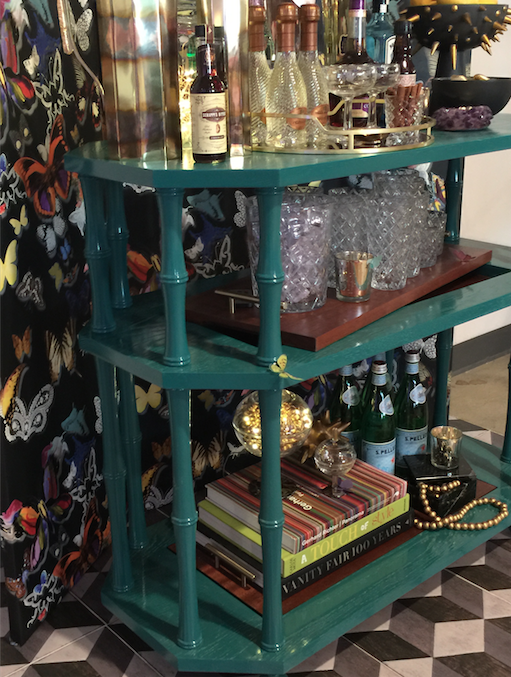 The idea was that you would style the top of your cart all pretty and you could take the tray with the drinks on it with you to serve around the room. The one we made for High Point stylistically was a little different and more in keeping with our Beach House/Love Shack theme. 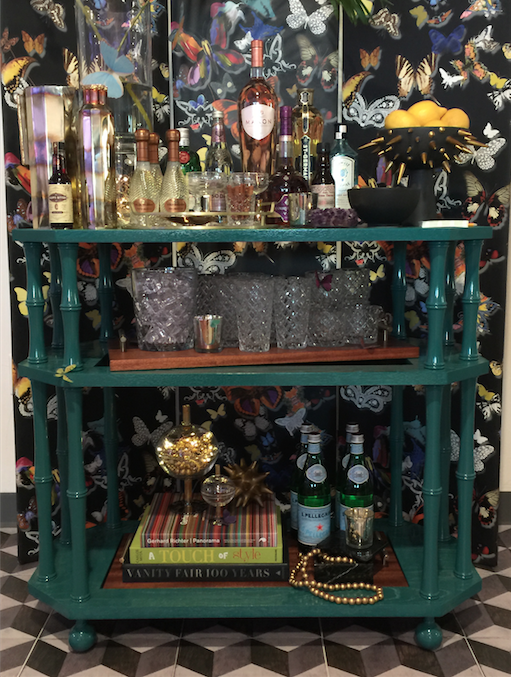 Made of oak, that we limed, this bar cart is the same design as the first, but obviously a totally different look. Astounding what a change in color or material can do for you. Next up are our new Windsor Chairs we're calling "Captain's Chairs." These are solid wood chairs that we've made in conjunction with Hitchcock Chair, a 199-year-old, Connecticut-based chair company. There are a number of Windsor-style designs out there, but many of them have been contemporized to the point of boredom. We wanted to add more turnings with these chairs, which you'll find on the arm supports and in all the stretchers (see, I even know some chair-speak now). The result is total comfort. Like, I could sit at this dining table until the next meal is served comfort. Need a little extra padding in the seat? (I don't, but Dunes certainly does.) Send us your fabric and we'll add a pillow. While we debuted our Capstan Table in New York at the show in August, we only showed it as a pedestal table with a 30" top. At High Point, where we have a little more room, we decided to do a surfboard-inspired oval top sitting atop two Capstans. All this is customizable, so when you're ready to order yours, you do what you want to do. Just want one pedestal with a glass top? How about a square top in white lacquer? Just ask! Sconces are a big thing for us and we added two new sizes of our most popular ones. We added a Mini Rachel Sconce and a Tiny Tiki Sconce. Both measure around 18" in total length with a shade. The shades you see on them here are our 7" high ovals, but I think we might be making a custom size for them later. But wait, there's more. We also did this vintage-inspired bench in collaboration with Hitchcock Chair. Again, send us the fabric, choose a color and you've got a conversation piece. There was also a few new ways that we're showing off what we do. Namely, a sconce wall with all our classic sconces in one place so you can easily decide what you'll need for your project. Those of course are our luggage racks and standing towel rack above with the sconces. We took the same idea and gave it a different spin with our custom dining table display. The theme, "Our Parts, Your Vision," was coined by Dunes. The idea was to illustrate that to design a custom dining table you just needed to choose your dimensions, your finish or finishes and a leg style. We do the rest.